Following Democratic National Committee talking points to the letter at the top of Thursday's NBC Nightly News, anchor Brian Williams saw Donald Trump's endorsement of Mitt Romney as an excuse to bash the Republican frontrunner: "New fallout from Mitt Romney's choice of words about the very poor, and tonight a new endorsement from a man who's catchphrase is 'You're fired.'" In the report that followed, correspondent Peter Alexander gleefully touted Democrats smearing Romney in the wake of Trump's backing: "For Romney, the endorsement of a billionaire businessman with this as his signature line [clip of Trump saying "You're fired"] Gave Democrats new fodder for attacks on cable." A nasty sound bite followed from DNC chair Debbie Wasserman Schultz: "They both like firing people and they've both made millions doing it." After playing a clip of a new DNC ad making the same point as Schultz, Alexander offered up a video montage of Romney's supposed gaffes during the campaign, declaring: "And it's not the first time Romney's gaffes have gotten him into trouble." On Friday's Today, the Trump endorsement itself was treated as if it were a new Romney gaffe. Co-host Matt Lauer wondered: "What about the timing of this?...he stands next to a billionaire the day after he made this gaffe concerning the very poor. Couldn't the Romney campaign have called Donald Trump and said, 'Look, we appreciate the endorsement. Could we hold this off a little while and do this a few weeks down the road?'" Meet the Press host David Gregory further criticized the Romney campaign's handling of the endorsement: "I just think that there was an aspect of this that was ham-handed. I think, you know, you had Mitt Romney saying, 'I've been successful, but Donald, not quite as successful as you.' I don't that really helps with the down-with-the-people tour over the next few weeks." Gregory added that Romney has "got to kind of work through this." Turning to chief White House correspondent Chuck Todd, Lauer speculated on how soon Romney would run away from Trump: "Would you expect Mitt Romney to now take this endorsement and yet carefully, subtly, but immediately begin to distance himself from Donald Trump?" Considering Trump is the star of one of NBC's long-running reality shows and a frequent guest on Today, it does not appear the network is eager to "distance" itself from the real estate mogul anytime soon. 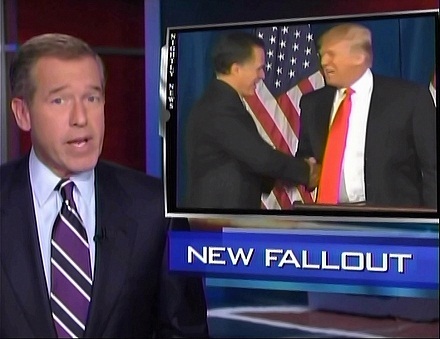 BRIAN WILLIAMS: New fallout from Mitt Romney's choice of words about the very poor, and tonight a new endorsement from a man who's catchphrase is "You're fired." We'll have all the news from the trail tonight. WILLIAMS: Now to the campaign trail today. Donald Trump found a way to thrust himself back into the spotlight, backing Mitt Romney, who was also pushing back against criticism that he is making too many verbal mistakes and it could hurt his candidacy. NBC's Peter Alexander on the trail tonight in Las Vegas. Peter, good evening. PETER ALEXANDER: Brian, good evening to you. There was no better evidence that this campaign moved to the wild west than Donald Trump taking the stage today. He said he's had several meetings in recent months with Mitt Romney and said he was ultimately swayed by Romney's strong performance in recent debates. Ever the showman, Donald trump stepped into the spotlight today alongside mitt Romney. DONALD TRUMP: It's my honor, real honor, and privilege to endorse Mitt Romney. ALEXANDER: In an event that lasted barely five minutes, Romney himself seemed to acknowledge the sheer spectacle of it all. MITT ROMNEY: There are some things that you just can't imagine happening in your life. Now, this is one of them. ALEXANDER: The hype that was vintage Vegas came with plenty of confusion. Several media outlets initially reported Trump would back Newt Gingrich, who later was dismissive. NEWT GINGRICH: The Donald is a force of his own. TRUMP [NBC'S CELEBRITY APPRENTICE]: You're fired. ALEXANDER: Gave Democrats new fodder for attacks on cable. DEBBIE WASSERMAN-SCHULTZ: They both like firing people and they've both made millions doing it. ALEXANDER: And, in this new web ad. Romney campaign officials insist the support of Trump, a Tea Party favorite, sends a message to the Party's grassroots. But today many conservatives are still scratching their heads after Romney's clumsy comments seeming to show indifference to the poor. ROMNEY: I'm not concerned about the very poor. We have a safety net there. PEGGY NOONAN [ON LAURA INGRAHAM RADIO SHOW]: Let me tell you what was wrong about it, it was almost martian-like in its remove from the concerns of regular people. ALEXANDER: And it's not the first time Romney's gaffes have gotten him into trouble. ROMNEY: There were times I wondered whether I was gonna get a pink slip. ROMNEY: Ten thousand bucks? $10,000 Bet? ALEXANDER: Gingrich today continued to target Romney's latest verbal fumble. Today Gingrich commented on Romney's latest verbal fumble. GINGRICH: I believe that we should care about the very poor, unlike Governor Romney. ALEXANDER: Tonight Romney is trying to put those inelegant comments behind him and turn a corner. He is refocusing on the central theme of his campaign, Brian, that his private sector experience makes him the best candidate to improve the American economy. WILLIAMS: Just another day on the campaign trail. Peter Alexander from Las Vegas. Peter, thanks.